The tousled, textured knots at the Tracy Reese runway show during New York Fashion Week had us swooning, so I just had to get the scoop from the fashion show’s official hair care sponsor, Ouidad, on how they created the romantic look, which would be perfect for boho brides. The inspiration for the hair look was “Afro Cuban” and Ouidad Creative Director, Morgan Willhite, embraced each model’s natural hair texture to create textured knots with tendrils flowing around the face. Prep hair with Ouidad PlayCurl Volumizing Styling Spray ($22) to encourage volume and texture. Once tousle dried, increase the appearance of natural texture by using a three-barrel waving iron. Break up the texture with Ouidad Wave Create Sea Spray ($23) to hold the style while providing a matte finish. Gather hair back into a ponytail and secure loosely with a hair tie. 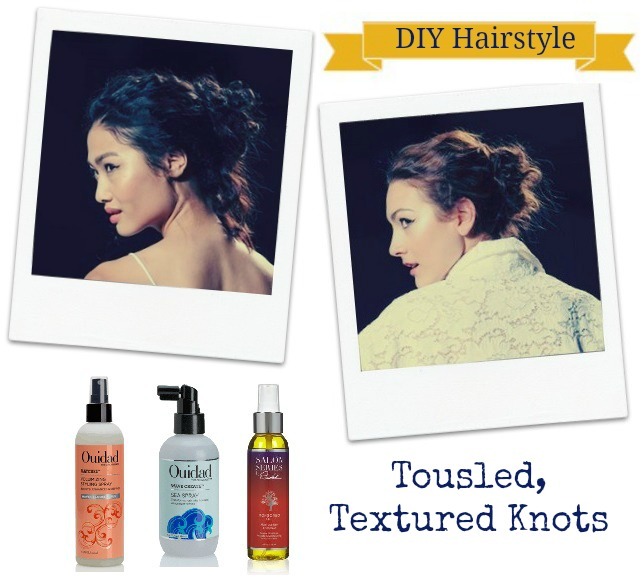 Use hair pins to create an “effortless” knot-like formation with soft flyaways tailing at the neck. To finish the look, use Ouidad Mongongo Oil Multi-Use Hair Treatment ($36) to smooth unwanted frizz and tame any dehydrated flyaways.